On 21 March 1918, one hundred years ago today, at four-forty in the morning, the German Army on the Western Front set in progress Operation Michael. That moment marks the beginning of the end of the First World War. 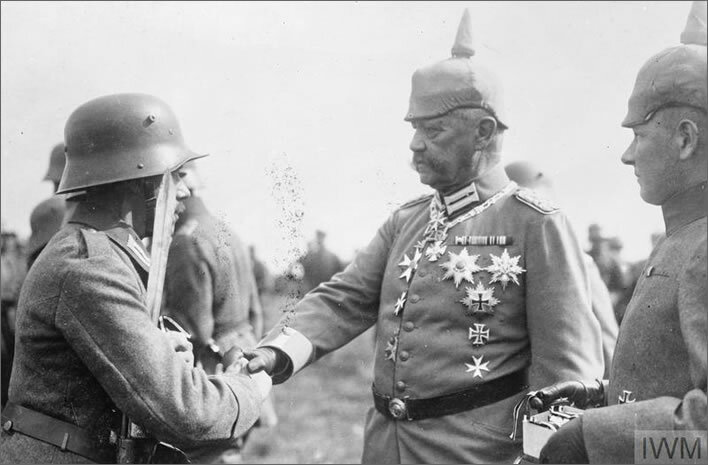 Field Marshal Paul von Hindenburg (1847-1934) decorating his troops, June 1918. Along with General Erich Ludendorff, Hindenburg was one of the principal architects of Operation Michael and the Spring Offensive on the Western Front in 1918. Image: Imperial War Museums. 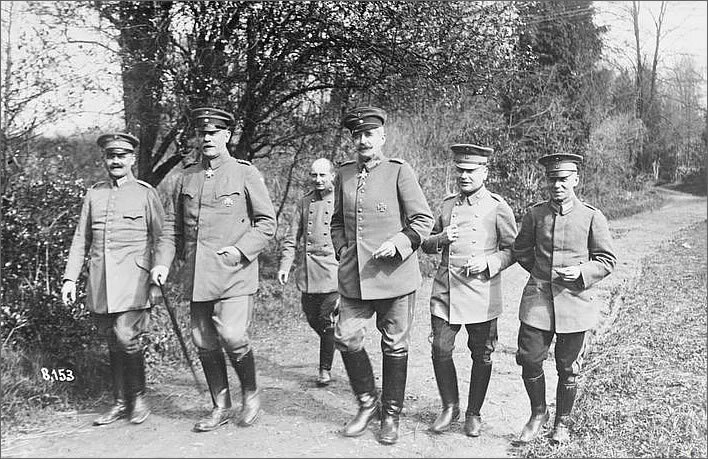 General Oskar von Hutier (1857-1934), second from left, the Commander of the German Eighteenth Army, with Major-General Traugott von Sauberzweig (1863-1920), his Chief of Staff (middle), with the officers of his staff in April 1918. Von Hutier was responsible for the development of the rapid, penetrating attack tactics which brought success to the Germans in the initial phases of Operation Michael. Image: Imperial War Museums. The operation lasted a little over a fortnight. In its first week it achieved remarkable advances in the front, but like a rubber band being pushed sideways, the frontline bulged out to the west, came to a stop and then returned more or less to its former position. The operation leaves us with that wearily familiar First World War fate: nothing lasting achieved, except dead and mangled bodies and churned up land. 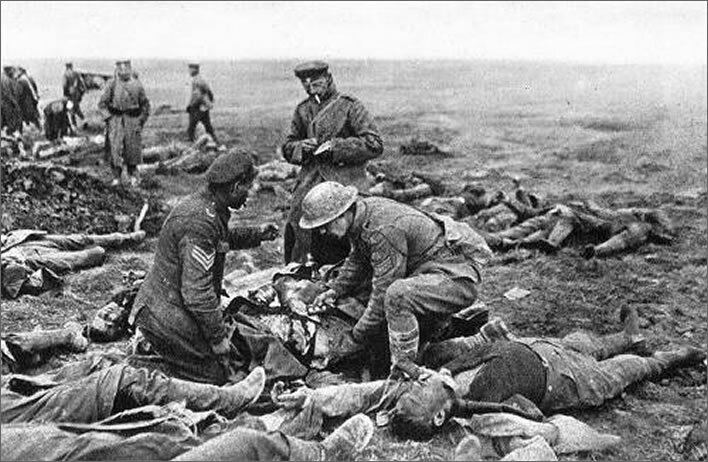 On each side the losses were around a quarter of a million dead, wounded or missing. German troops, aided by a British sergeant major, recording the personal details and collecting the belongings of the British fallen. Image: source unknown. After Operation Michael there were further alarms and excursions, but within eight months the lunacy was all over: the armistice was signed on 11 November 1918 in a train carriage in the woods of Compiègne. After the horrors of 1916 on the Western Front the sensitivity of observers and commemorators seems to have dulled: horror fatigue inured them to what came later. However, in 1918 the meat-grinder also turned just as it had done in the previous four years. Normal people will find the following photos distressing. That may be so – but sometimes a charming red poppy once a year just isn't enough. 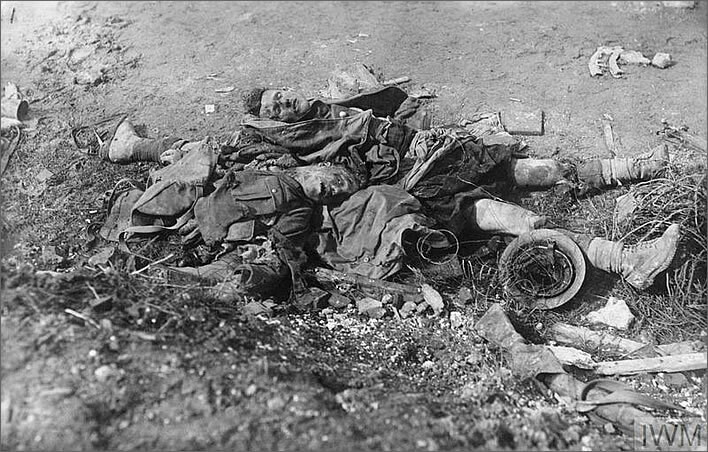 Dead Scottish soldiers on the battlefield near Longueval, March 1918. Yes, they are what you think they are – one of the few beneficiaries of war. 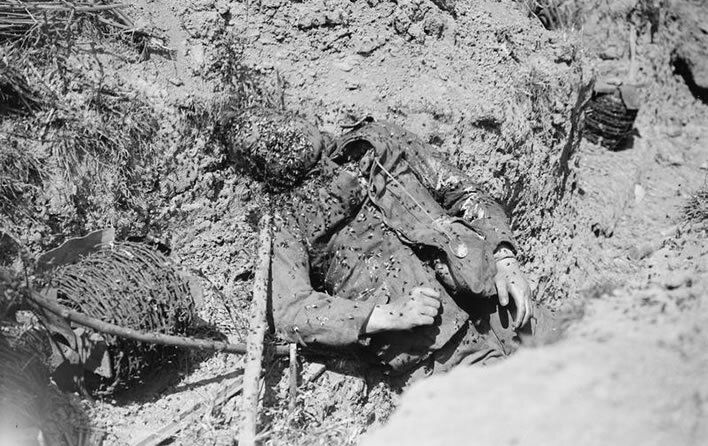 The body of a dead German covered in flies. 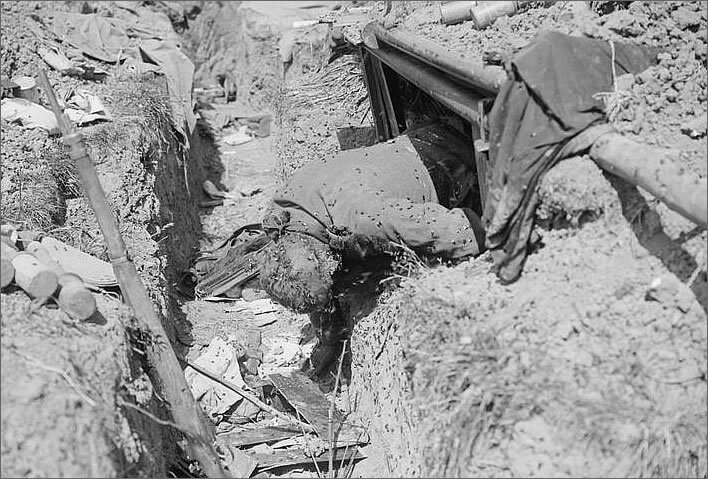 He was killed whilst emerging from his dugout in a trench which was captured by the 2nd Battalion, King's Own Scottish Borderers at La Becque. Arrewage, 4 July 1918. Still with his pipe in his mouth. British dead waiting to be buried at the Windmill British Cemetery, near Monchy-le-Preux, during the German Spring Offensive. 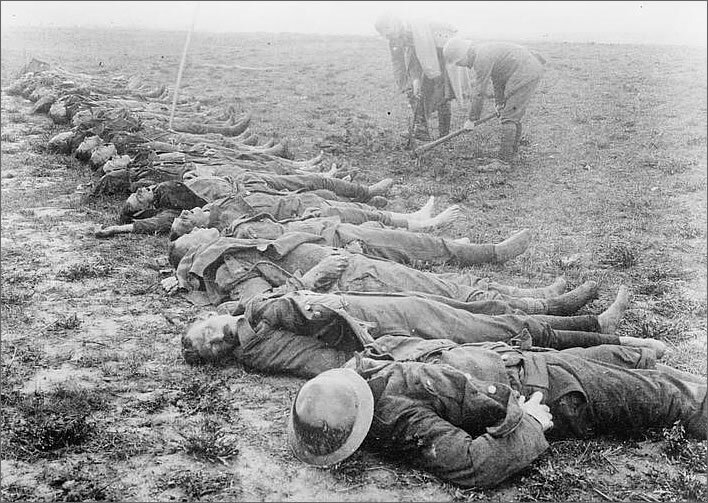 British dead being prepared for burial, April 1918. (All the images in this section: Imperial War Museums). 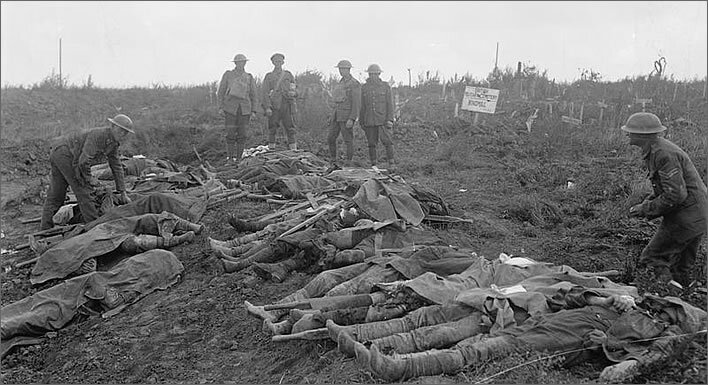 Altogether probably well over half-a-million casualties – dead, wounded and missing; the images of the dead – sons, fathers brothers – shown here were repeated, say, 200,000 times. Operation Michael wasn't quite the beginning of the end, for it had its own beginning on 3 April 1917 in Zürich, when Vladimir Ilyich Ulyanov, better known by one of his aliases, 'Lenin' (1870-1924), and his wife, Nadezhda ('Nadya') Konstantinovna Krupskaya (1869-1939), together with a group of revolutionary exiles left by train to return to Russia. The German authorities permitted and eased their rail and ferry passage across Europe to Petrograd, where they arrived on 16 April 1917. Within a few months the Russian Government was toppled and a Communist government took its place. The people of Russia were as tired of the First World War as anyone else, so the revolutionary leadership cemented its popularity by calling a ceasefire with the Central Powers shortly thereafter on 15 December 1917, culminating in the peace treaty of Brest-Litowsk on 3 March 1918. Russia lost important territory with this treaty, but gained peace – to the relief of the Russian population and to their new Communist masters, who now had time to push through their revolution with the support of the grateful troops. The Germans therefore knew in December that their eastern front would close down. The men and materiel from there could now be concentrated onto the Western Front. Suddenly, for the first time since the beginning of the war, they found themselves with a numerical superiorty over the Allies. Now was the time to strike, before the Americans arrived. The USA had declared war almost a year before on 6 April 1917, but their troops did not start arriving until the spring of 1918. Hence the great push of Operation Michael in March 1918, the 'largest military operation mounted by any army since the original German invasion of France and Belgium in August 1914' (Middlebrook). 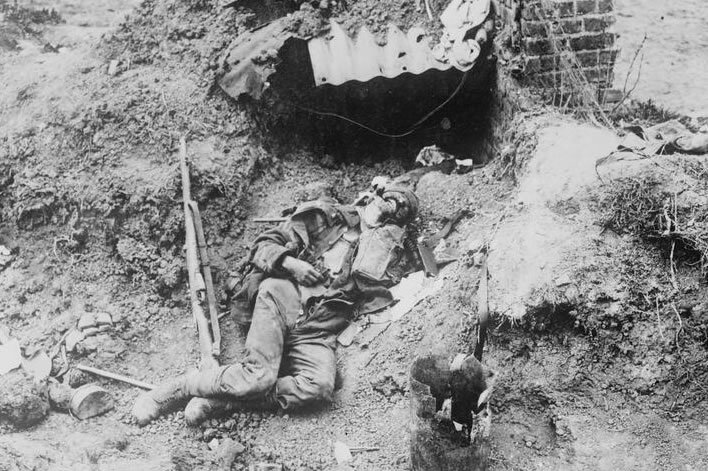 After the collapse of Operation Michael and the other German spring offensives on the Western Front in 1918 it is a fair summary that the German military command simply ran out of ideas – trench-warfare didn't work any more, attacks along broad fronts ditto, tactical rushes ditto. Numerical superiority had been thrown away. The American troops were arriving. What now? Wars are not just won or lost by armies but also by countries. There was war-weariness and unrest in Britain in 1918, but Germany and the Austrian Empire were seething. Revolution was in the air. The German government may have injected Lenin and his friends – that 'plague bacillus', Churchill called them – into Russia, but they had plenty of their own Bolshevik bacilli at large in Germany. There were shortages, starvation, the streets full of amputee beggars with nowhere else to go. The imperial militarism of the Junker-class had led the common people to disaster. Germany and Austria crumbled and their armies crumbled with them. The end would take eight horrible months of pointless military engagement to reach, but the journey to that point started when that German barrage opened up in the early morning of 21 March 1918, one hundred years ago today. The Hotel de Ville [in Doullens] was the scene of an important meeting on 26 March 1918 between British and French commanders and politicians. It was a time of crisis. 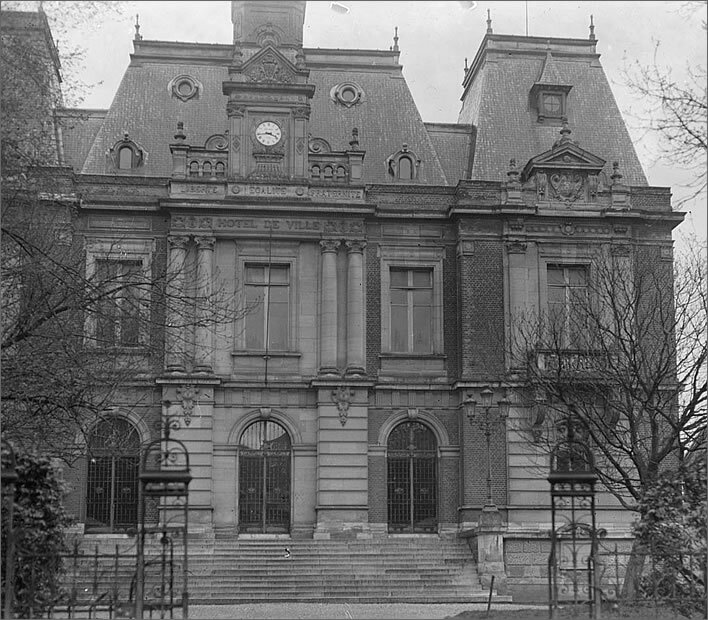 Hôtel de ville, Mairie de Doullens in 1920. Image: Imperial War Museums. Both British and French forces were falling back under the German offensive and there was a danger that the two armies might become separated due to the lack of unified command. The main problem was the shortage of reserves in front of Amiens. Sir Douglas Haig said that he was willing to place British forces under the control of General Foch, the French Chief of the General Staff. The French responded by taking over part of the British line at Amiens and bringing in more reserves. The result was that there was unified command on the Western Front for the first time in the war and Amiens was saved. 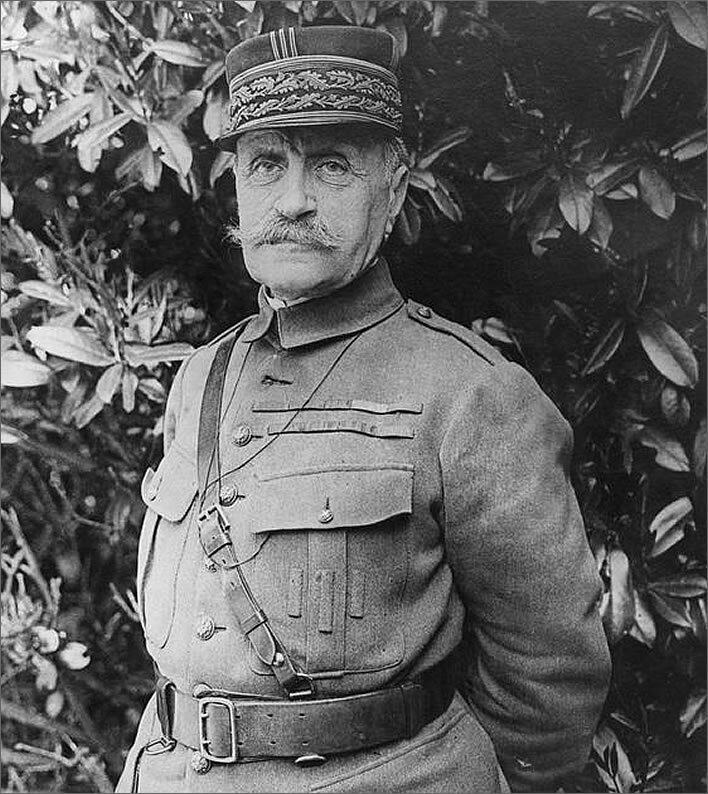 Général Ferdinand Foch, the Commander-in-Chief of the Allied Armies, at Sarcus, 17 May 1918. Image: Imperial War Museums. 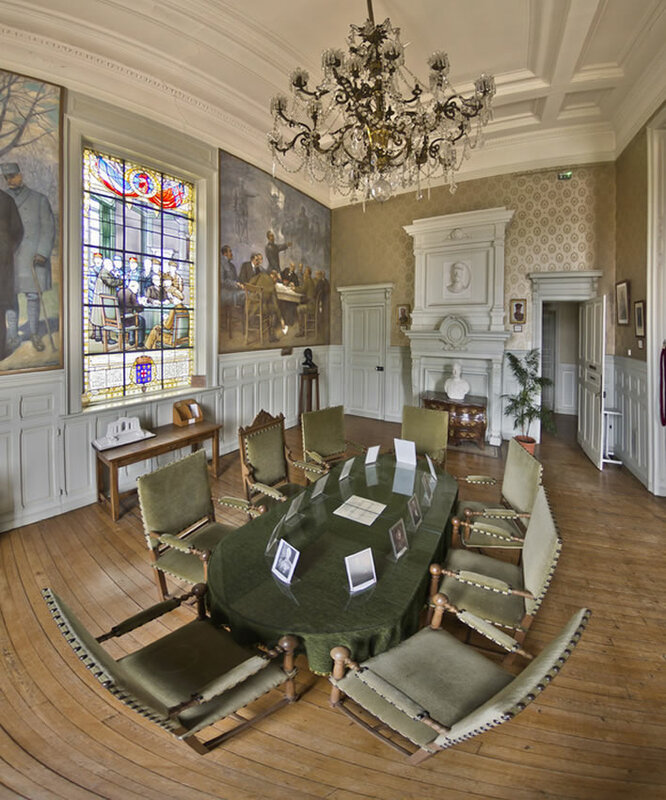 Doullens took great pride in the town being the scene of this important event and preserved the room in which it took place, keeping the same table and chairs and adding a stained-glass window and a painting of the meeting. It makes an interesting visit. Just go to the Hotel de Ville and ask to see the Salle de Conference. The English-language leaflet provided, however, is not impressive. References to 'despair' and the possibility of surrender at the time of the meeting may have entered French minds, but that was not the British mood; and, in references to the subsequent counteroffensive and the final advance to victory, there is no mention of the dominant role played by British forces, but only to that of the French. Middlebrook, Martin, and Mary Middlebrook. The Somme Battlefields: A Comprehensive Guide from Crécy to the Two World Wars. Penguin books, 1994. p. 309f. La salle du Commandement Unique, the 'Room of Sole Command', as the French quaintly call it, thus quite correctly stressing Foch's momentary ascendancy, is situated on the first floor of the Mairie de Doullens, at the rear of the building. Image: ©Stéphane Compoint (photographer, used with permission). The participants shown are (back row, left to right): général Maxime Weygand, général Philippe Pétain, général Ferdinand Foch, Lord Alfred Milner, General Henry Hughes Wilson, General Lawrence; (middle row, left to right): président du Conseil Georges Clémenceau (Prime Minster and War Minister), président Raymond Poincaré, Field Marshal Sir Douglas Haig; (front row, left to right): Louis Loucheur, General Archibald Montgomery. Image: Adapted by Figures of Speech from a base image ©Somme Tourisme. 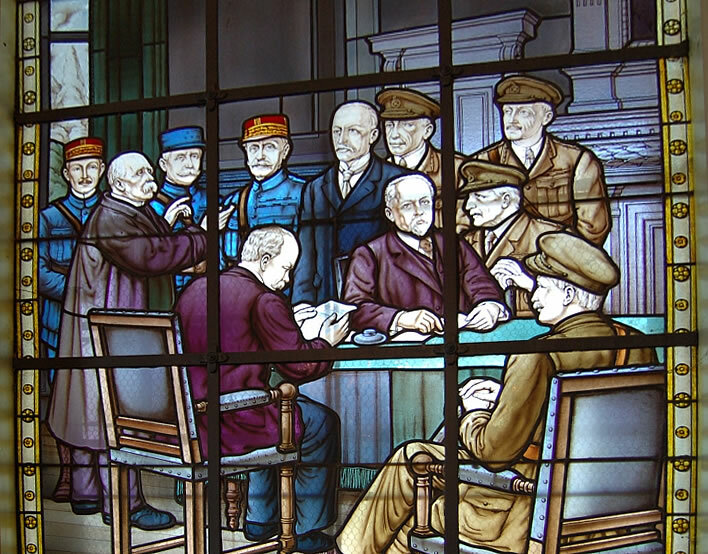 The painting on the left of the window (1936) depicts the French participants in the Doullens conference, standing in front of the hôtel de ville. 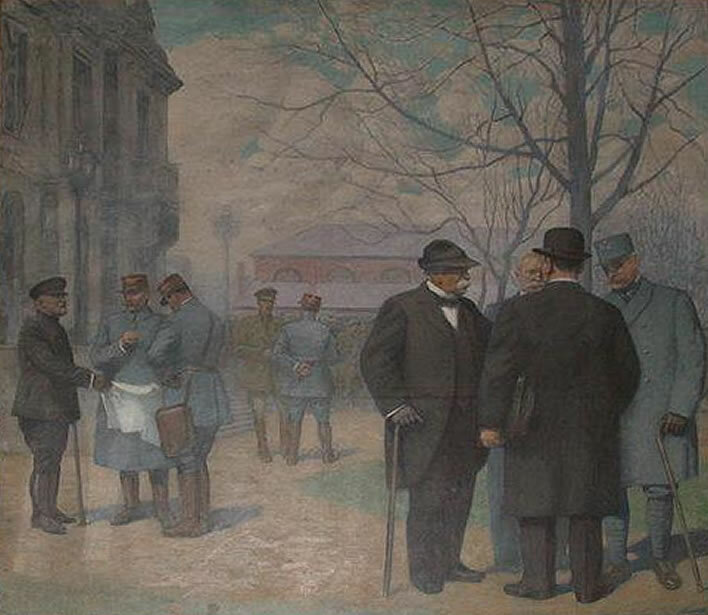 The group on the left consists of président Raymond Poincaré (in his 'war uniform'), général Foch et général Weygand; the group on the right of Georges Clémenceau, Albert Rousé (the Mayor of Doullens – very important to get him in), Louis Loucheur and général Pétain. Image: ©Monuments historiques, photographer Pierre-Yves Corbel. The painting on the right of the window (1937) depicts the conference in progress. The participants shown are, from left to right: général Mordacq, Louis Loucheur, général Weygand, General Wilson (bending down to allow an uninterrupted view of the French), général Foch (standing), Georges Clémenceau, général Pétain, General Montgomery, Field Marshal Sir Douglas Haig (the irrelevance at the back), président Raymond Poincaré and Lord Milner. 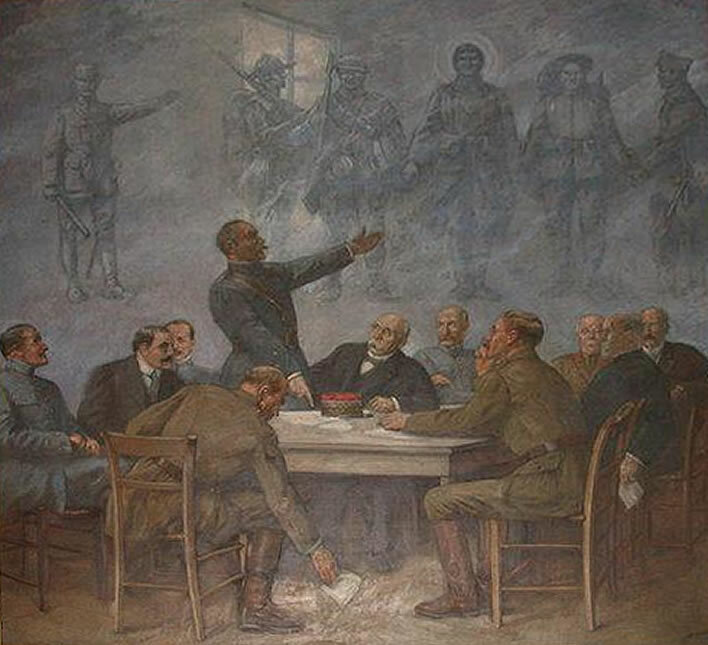 Foch seems to be articulating his 'fight and never give in' vision before the company, echoed by the ghostly apparition behind of him in the same pose alongside soldiers of various nations with hands held. The ghostly Foch seems to be holding a marshal's baton, although he only received this distinction on 6 August, several months after the conference. Image: ©Monuments historiques, photographer Pierre-Yves Corbel.